Although the first major forum in California's political race focused on Latino issues, by the time it was done it was clear that former Los Angeles mayor Antonio Villaraigosa still had work to do to get Latinos behind his candidacy. The 2018 Gubernatorial Forum was the culmination of events; polls, messaging, and press relations, that the Latino Community Foundation aimed at illustrating that Latino voters are concerned with more than just immigration and that the candidates should not assume Latinos will automatically vote for a Latino candidate. "There is this sense that Latinos are going to just stand behind Antonio Villaraigosa, but we need to question that” assumption, said Jacqueline Martinez Garcel, the CEO of the Latino Community Foundation, which sponsored the Thursday evening event with Spanish television network Univision. Although he's still considered a strong contender for the Latino vote, Villaraigosa had to take a few jabs at his post-mayoral work as a spokesman for Herbalife, a nutritional supplement company whose products are sold in a system similar to Amway, Avon and Tupperware. Polling of Latinos conducted prior to the forum showed that Villaraigosa had a clear advantage over California's Lt. Gov. Gavin Newsom, 39 percent to 15 percent. 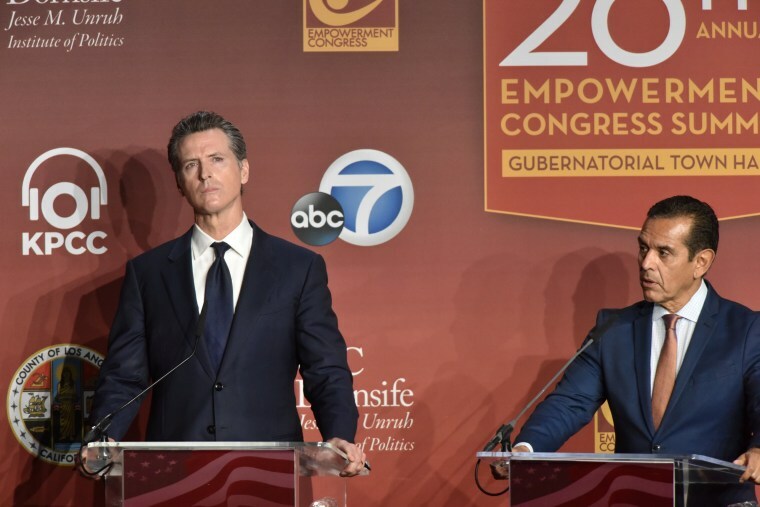 But Newsom is considered the favorite overall and the poll also showed that 22 percent of Latinos still have not decided who gets their vote. The polls also showed that affordable housing, the environment, health care, and education were among the top priorities for Latinos. In California's primary system, the top two vote getters, regardless of party, advance to the general election. Newsom, entered the forum somewhat of an underdog , given the venue, University of California, Los Angeles. UCLA, which is not only a hub of California’s Latino population, but it is also the home turf of Antonio Villaraigosa, the former mayor of the city of Los Angeles. The applause at the beginning of the introductions seemed to illustrate that it would be an easy evening for Villaraigosa, but several questions caught the former mayor off guard. First, was the discussion on single payer health care, which Villaraigosa has not fully embraced. He was pressed on whether he supports it but his responses focused on increasing existing programs, “I’m single payer in concept” he repeated continually. Second, was the moderator’s questioning about his relationship with Herbalife, which paid out a $200 million dollar settlement after it came under investigation by the U.S. Federal Trade Commission for unfair trading practices. “Many of their customers were Latino, do you owe them an apology?”, asked moderator Ilia Calderón. Villaraigosa’s response was to attack Newsom’s wine business, beginning a flurry of attacks and counter attacks that left Villaraigosa bruised. Even though organizers wanted to emphasize Latino interest in issues beyond immigration, immigration got a giant spotlight. Garcel was upbeat about the message their event sent to the candidates - that the candidate who would stand up to the attacks against immigrants had a leg up. “The questions (in the forum) about immigration shined a light on the attacks against us even in a state as progressive as California,” Garcel said. Two Republican candidates, John Cox and Travis Allen, focused their message on the “rule of law” rather than effectively communicating whether or not those laws reflect the values of California. By contrast, John Chiang, the current California state controller whose parents came to the United States as immigrants, said “California was built on the back of immigrants. We are going to fight for them because fundamentally we are about dignity, decency and respect.” He said he thinks President Donald Trump should be deported, eliciting cheers from the crowd. Delaine Eastin, the former schools superintendent and a former state Assembly member, also is in the race. She gave resounding support to the Dreamers and whoops and applause when response when she referred to President Donald Trump as the "orange-haired, misogynist racist."